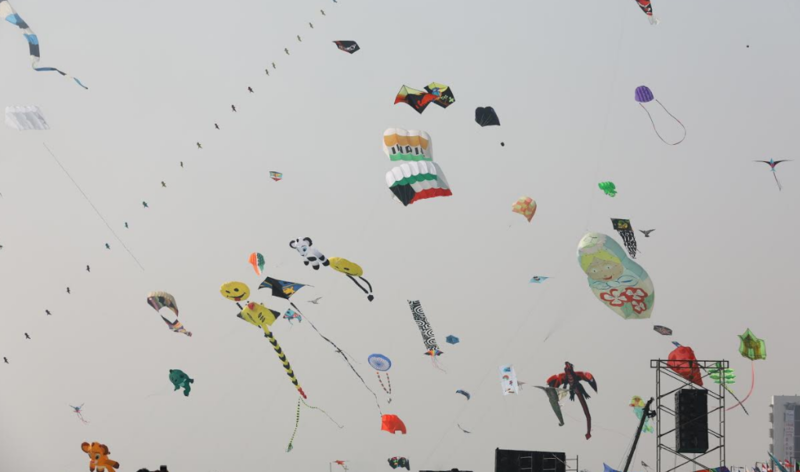 The festival of kites ‘Uttarayan’, one of the most popular and colorful religious celebrations in Gujarat held on January 14 and 15 every year, is likely to be a ‘very-good’ one for the second consecutive time with regard to ‘availability of wind’. In fact for the festival-lover Gujaratis, when Uttarayan knocks around the corner, ‘wind’ takes the center-stage of discussion on the eve of Uttarayan. On Uttarayan and Basi Uttaryan (Jan 15) when lakhs and lakhs of colorurful kites fill the sky across the state and most of the people are seen on the roof-top through out the day doing kite-fight, shouting ‘Kypochhe’ after cutting the kites and making merry all the way in traditional manner, the presence of good wind adds to the mood while its absence creates a sense of gloom. Now the good news is that like last year, this year also there will be enough wind to make kite flying a fun on Uttaryan as well as Basi Uttarayan. Normally for a good kite flying experience the wind speed of 10km per hour is fine. Ahmedabad Met center Director Jayanta Sarkar today said that the average wind speed on January 14 and 15 was likely to remain between 15 to 20 km per hour. At times the wind speed will go up and at times come down a bit but over all it will be good through out. He also said that owing to some western disturbances the weather across the state was cloudy which will make the maximum temperatures fall a bit in the coming days but the minimum temperatures would go up. It means that there won’t be any feeling of chill or cold wave and at the same time the general type of cold would be there. Sarkar also ruled out any possibility of rain owing to the cloudy weather. Notably, last year Gujarat has got a ‘double bonanza’ of sorts before Uttarayan, weather-wise. The biting cold-wave till just before the festival owing to heavy snowfall in Northern states had vanished and the wind speed was also very good with an average of 12 to 15 kmph.